GBC-ECE students studying at the Ryerson campus will be issued Ryerson/George Brown identification cards: which are activated at the circulation desk. may borrow from all circulating collections, including audio-visual and reserve items. 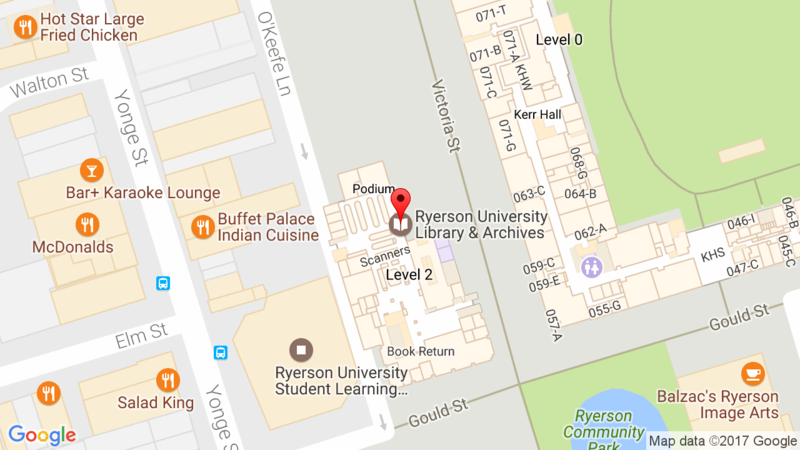 does not include off-campus access to the Ryerson library’s electronic resources. However, George Brown faculty, staff and students can use Ryerson University’s Internet network while on Ryerson campus to access George Brown’s databases through Eduroam. See instructions and information on George Brown’s website. interlibrary loan is available through the GBC Academic Resource Centre in the Sally Horsfall Eaton Centre. students enrolled at Centennial and George Brown may apply for a free Ryerson Library card by presenting a valid photo ID card from their home institution. collaborative BScN students may borrow up to 10 books at one time. reference and reserve items may not be borrowed, including AV materials. does not include off-campus access to the library’s electronic resources. interlibrary loans are not available. Faculty and staff cards are valid for a 12-month period from the date of issue.